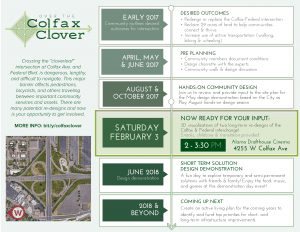 We are ready to kick off 2018 by rolling out 3D visualizations of long-term re-designs of the Colfax & Federal interchange. Snacks, childcare and translation provided. We will also be announcing details and next steps on the design demonstration. See flyer in image English and also y Español at bit.ly/colfaxclover.